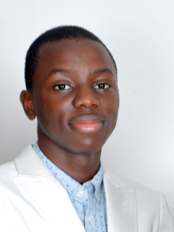 Theophilus Aluko, ’16, Mechanical Engineering, is Prayer/Evangelism Coordinator for UMBC’s Bethel Campus Fellowship. 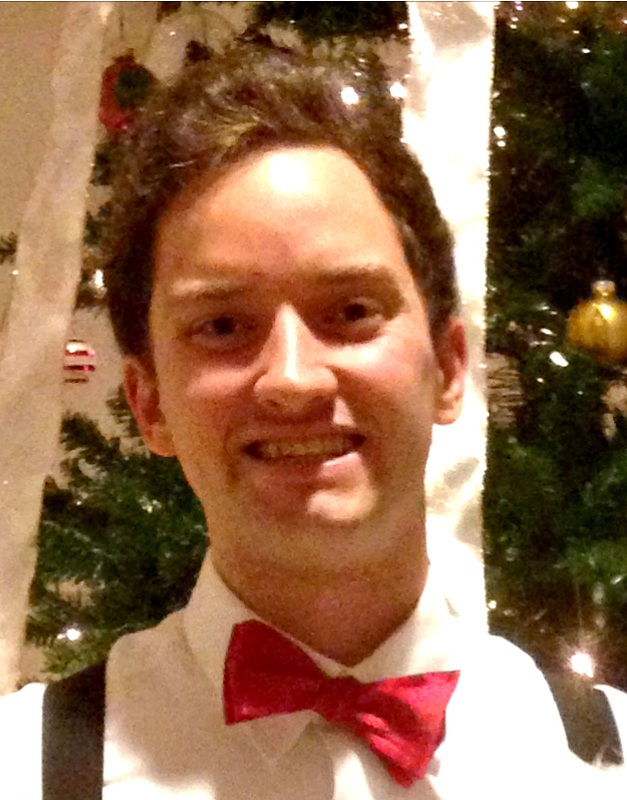 Andrew Blow,’16, Mechanical Engineering, is President of UMBC’s student chapter of the American Society of Mechanical Engineers (ASME) and Philanthropy (Abilities) Chair of Pi Kappa Phi fraternity at UMBC. 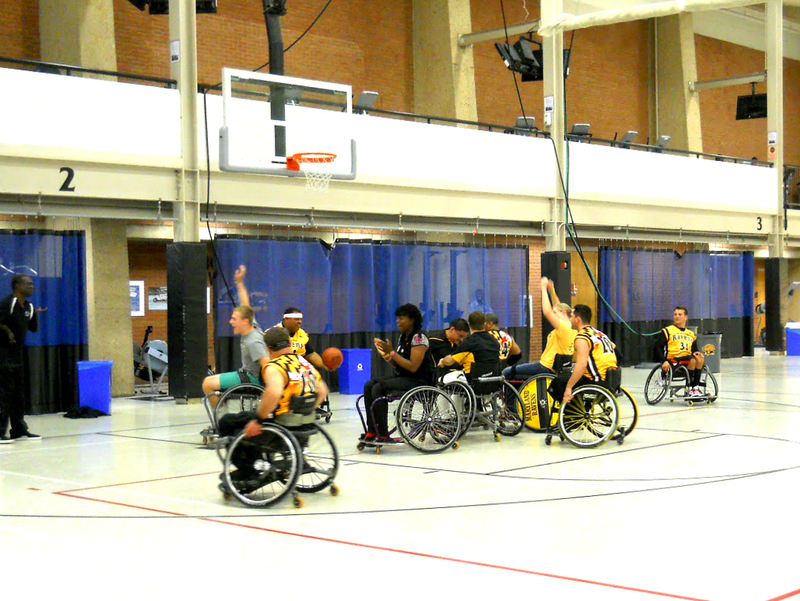 Earlier this semester we worked together to create a wheelchair basketball tournament at UMBC, as a first step toward a more inclusive campus culture and experiences for people with all levels of physical ability. This is our story. Early in my sophomore year, I joined the Social Change Interest Group launched by Virginia Byrne, UMBC’s Coordinator of Student Life for Leadership Development and Education. I was challenged to be an agent of civic and social change. During winter break, I became frustrated by the challenges people of varying levels of physical ability faced at UMBC if they wanted to play sports or get involved. On a more personal note, my inner drive for this initiative is my faith in Jesus. I knew that something had to be done, but that one person couldn’t bring about the necessary changes alone. That was when I conceived the Adaptive Sports Initiative. My initial idea was to establish an adaptive wheelchair basketball group that would allow for athletes of all physical abilities to participate in the sport, with the hopes that it would have a resonating impact on other areas of the campus. Virginia was able to direct me to potential resources on campus, including people from Student Support Services, the Shriver Center, Residential Life and Athletics. I was meeting with Cassie Thompson from Student Support Services when UMBC undergraduate Steve Bobadilla coincidentally dropped by and Cassie introduced us. Steve had been playing wheelchair basketball for a while, and we started brainstorming about how we could collaborate. Steve and I worked through his connections with Gerry Herman from the Kennedy Krieger Institute’s Physically Challenged Sports and Recreation Program and Jim Glatch (former wheelchair basketball coach for Team USA), and reached out to the Maryland Ravens (the official wheelchair basketball team for Maryland), who were able to supply wheelchairs. At Virginia’s recommendation I also connected with leaders from Pi Kappa Phi Fraternity, which had done philanthropic work around adaptive sports. That was how I met Andrew.. At Virginia’s recommendation I also connected with leaders from Pi Kappa Phi fraternity, which had done philanthropic work around adaptive sports. That was how I met Andrew. Together we worked with Gary Wohlstetter and Tim Hall from UMBC’s Athletics Department to secure the Retriever Activities Center for a demonstration event, and made connections with potential partners all over campus: faculty members, administrative leaders, student organizations and individual students. We also reached out to potential off-campus partners like the U.S. Veterans Affairs Volunteer Services office. 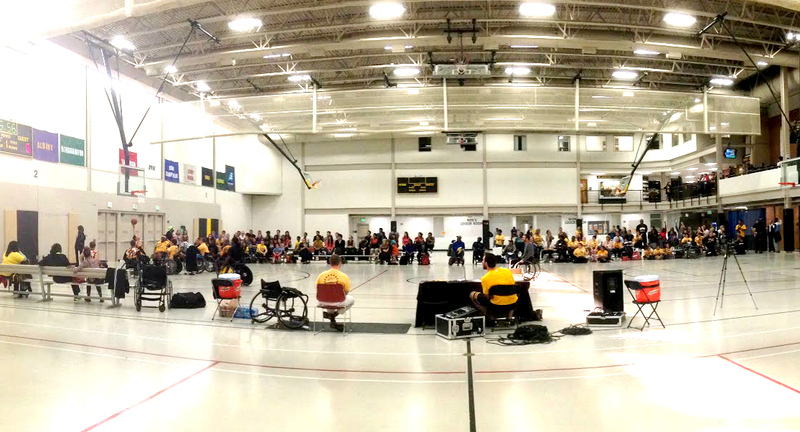 The support we received for this effort was astonishing and inspiring. At long last, after a massive publicity effort, the event took place on October 17th. And what an event it was! 200 students, athletes, faculty members, admins, staff, parents and others attended, supporting their departments, family, coaches, and friends as they happily wheeled their way through the basketball game against the renowned Maryland Ravens. Aside from me and Steve, UMBCs lineup included students from the SUCCESS Program, graduate students, members of multiple Greek Life organizations, and both of UMBC’s head basketball coaches! Harnessing the energy from the October 17th event, some of the students and staff involved in the planning have formed an Adaptive Sports Committee. (Interested in joining? Let me know). We’re in the process of establishing the wheelchair basketball group as an intramural sports organization, securing more sports chairs, and considering new sports to address (tennis? sailing?). The speed at which this initiative was launched exemplifies UMBC’s culture of promoting innovation and leadership among its students. I’m most excited to see the recognition of the need to accommodate and include people of all abilities spread beyond sports to other aspects of campus life. Pi Kappa Phi President Rubin Waranch came to me near the end of the summer with a proposition to host a wheelchair basketball demo game. I am the philanthropy chair for Pi Kappa Phi and have had 4 years of coaching experience with a Special Olympics Swim team, so ability sports are a big deal to me. I have seen first hand the impact they can have, not only on the athletes but on the community that surrounds them as well. I wanted to be able to bring that experience to UMBC and give my friends and peers the opportunity to work with and participate in ability sports. The Ability Experience and Special Olympics focus on supporting and helping people see the capacities of people with mental disabilities. Those organizations’ ideals have become my own in the time I have been involved with them, and gave me the drive to make this event a success. 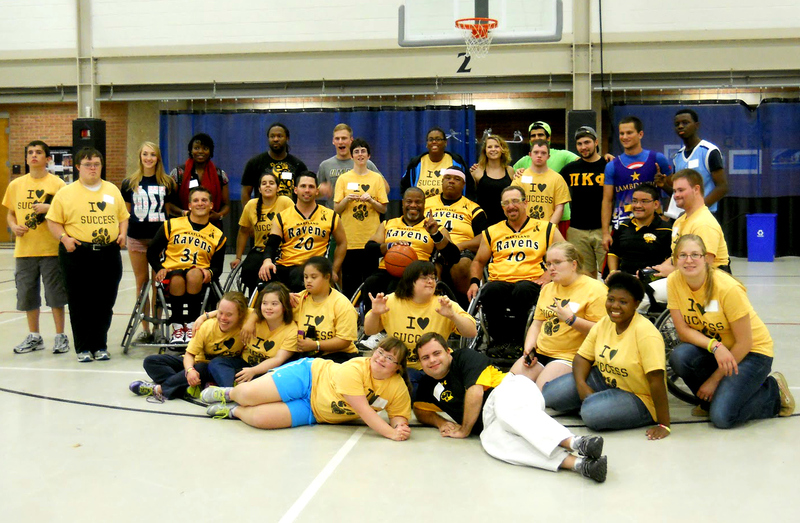 I had attempted to host a wheelchair basketball event in spring 2014 as a part of Pi Kappa Phi’s Ability Experience Week, but had not been able to pull it off myself. The initiative Theophilus and Steve developed provided me with a team to work with to get everything done and execute the event in a way that I never would have expected. The team I worked with consisted mostly of Theophilus, Rubin, and myself. I had a busy semester with my classes and other student organizations but Theophilus and Rubin were great about keeping me in the loop. My contacts within Pi Kappa Phi and The Commons, my experience hosting Ability Experience events, and leadership experience with other student organizations served as a strong background when it came to ironing out the details and considering how to build awareness of the need to engage people with different abilities at the event. It was easy finding volunteers from Greek Life organizations, and their presence at the actual game was tremendous! I couldn’t have asked for a more successful inaugural event. We had over 200 students, parents, faculty, staff, and alumni attend the game after either working with them during the planning process or advertising to them through social media. I’m grateful to my Pi Kappa Phi brothers for passing out fliers, setting up for the event, collecting donations, providing some of the loudest cheers, staying afterward to clean up. The success of the event itself showed that if there are motivated students who truly want to see something happen, there are people out there that will help us get it done. I want to be able to work with this initiative and help it grow into a full fledged program with multiple sports to assist people with physical and mental disabilities. Contact the authors: Theophilus Aluko at taluko1@umbc.edu, and Andrew Brow at abrow1@umbc.edu. Check out a project by some amazing UMBC students!